Green Vision ambassadors and professionals gathered at Squires Sanders at 2 Park Lane in Leeds on Wednesday evening for another engaging Green Vision event. An excellent panel of speakers, chaired by Martin Brown at Fairsnape, covered the practicalities of Specifying Green Products and highlighting excellent resources and online tools available for use by construction professionals.John Gelder presented a well-organised, seamless systematic review of Environmental Specification throughout the stages of a Project Timeline. Brian Murphy introduced our members to a parallel world to NBS taking us on a quick tour of Green-Spec Studio and the CAP’EM tool. Finally Sophie Stephens from Balfour Beatty showed us what they have been doing with Green Materials in practice. John holds the position of Head of Content Development and Sustainability for RIBA Enterprises and whilst this title implies Sustainability as a bolt on, John presented the opposite: Sustainability as an integral consideration throughout the project lifeline of the RIBA Plan of Works (2013). The information was extensive and precise highlighting key environmental considerations for each stage providing the relevant standard, guidance along the way. Interestingly John was adamant that this is ‘Not just carbon, not just ‘all about us’, and not necessarily negative’ encouraging us to take a positive view of our natural environment and impacts. Brian Murphy focused our attention on Green Spec Studio, an online free access design and specification assembly tool with over 600 registered users and 859 elemental assemblies and secondary elements. Whilst NBS software and Green Spec are parallel worlds, both will continue to grow, converge and perhaps meet in the middle at some point in the not too distant future. Brian hinted at future development of Green Spec to reclassify to suit Uniclass2012 at the next update. Sophie, Environmental and Sustainability Manager at Balfour Beatty stressed the importance of specifying green materials in order to meet the clients ever growing demands for BREEAM buildings as 12.5 percent of the BREEAM score is down to sustainable materials procurement. Sophie highlighted difficulties in identifying chains of custody and the importance of getting evidence to prove that materials are sustainably sourced and hinted that whilst BREEAM is a great tool for stimulating demand for greener buildings, they have in fact been able to produce buildings that perform to a higher environmental standard on projects that are not working towards a BREEAM certficiation. Our latest Green Vision tweetchat continued the autumn 2012 series and explored transparency in Green and Healthy building products. The chat certainly was green and vibrant, View the story “Green and Healthy Building Products ” on Martin’s Storify page. The theme and comments from this chat will gp forward to our half day conference on the 12th December in Leeds. A Built Environment without Ash? Can we even start to imagine a Built Environment without Ash, or Scots Pine for that matter? Or a built environment with severe restrictions on movement and transportation of timber, where design and construction, from necessity has to be focused on local timber sources. There has been a huge amount of coverage in the media, and indeed across social media on Ash dieback disease, but little as yet related to the built environment, and the role we may have played in the spread of the disease or the potential impact it may, no will, have on the built environment. The built environment is accountable for around 40% of climate change issues (waste, transport, carbon, energy etc) but its the increase in demand for instant green that may be our biggest contribution. Odd isn’t it that efforts to plant trees and plants to provide green landscapes and green roofs in response to CO2 and biodiversity issues may have opened the door to yet bigger problems. We face a tidal wave of diseases with over 30 damaging pathogens identified poised, ready to threaten UK trees and plants. See Guardian article. We face movement and transport restriction on timbers from Ash, Scots Pine and other plants, both in landscaping and use in construction, finishes and furniture. 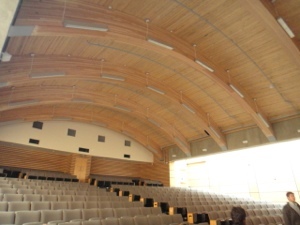 I am reminded of my visit to UBC CIRS building in Vancouver last year and the gorgeous timbers in the atrium and main hall, timbers ‘salvaged’ from local forests affected by pine beetle disease and closely monitored by the Living Building Challenge. As we launch Living Building in the UK with a UK collaborative, it may well be that the certification of future green buildings in the UK is through standards such as the Living Building Challenge, that give hard earned recognition to buildings and facilities that, like plants, contribute to making the world a better place. The CIRS Building was recently profiled in our CKE Green Vision series with a presentation from Max Richter at Perkin+Will. For more information on the Living Building collaborative in the UK, leave a comment, get in touch or pop over to our Living Building UK Collaborative page on Facebook and say hello.